When young French designer Charlotte Perriand interviewed with Le Corbusier for a job in 1927, he turned her away with this biting (and sexist) comment: “We don’t embroider cushions here.” Le Corb would eat his words later that year, when he offered Perriand a job after seeing her tubular steel furniture. Despite skepticism from a male-dominated profession, Perriand enjoyed an auspicious career. She was appointed by the Japanese government as an advisor on industrial design, and stayed for two years, traveling and studying. It was in Japan that she designed one her most famous pieces, the Tokyo Chaise Lounge, a play on Le Corbusier’s famous LC4 Chaise (which Perriand actually helped design). After studying local woodworking, Perriand decided to replace the LC4’s steel tube base with 12 bamboo slats, giving the Lounge an organic elasticity and texture. It was a brilliant remix, before remixes existed. But the Tokyo Chaise was never mass-produced. It’s existed only in museums, photographs, and the homes of collectors. Until last month, when 70 years after its birth, Italian furniture manufacturer Cassina unveiled the first consumer version of the design. The Tokyo Chaise is part of Cassina’s new outdoor line, which waterproofs a few other seminal Modernist pieces (Le Corb chairs, mainly). 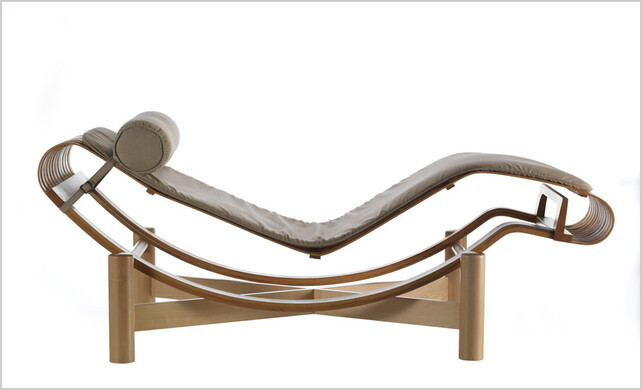 It seems that Cassina’s version is relatively true to the original, with a few new details for outdoor use: It comes in bamboo, teak, and beech, and replaces the original leather padding with waterproof polyurethane. With Cassina’s revamp, you can now outfit your deck with elegant Modernist classics, but here’s a gentle reminder from Perriand herself about the dignified pieces: “While our chair designs were directly related to the position of the human body… they were also determined by the requirements of architecture, setting, and prestige.” In other words, don’t BBQ near it.